As you can probably already tell, I am a huge fan of food and therefore food tours. Trying the local food is a very important part of our travel experience. While the local food can easily be experienced on one’s own, a food tour allows for learning more about the traditional foods and culture and can help you know what to look for when exploring on your own. 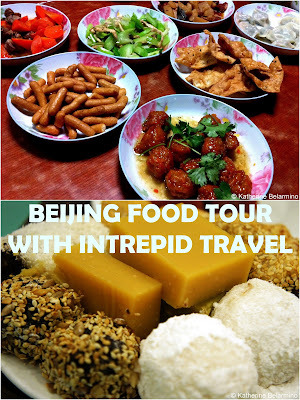 During our travels to China we were excited to be the guests of Intrepid Travel and join their new Beijing food tour, Real Beijing Gourmet. We met our local guide Dennis a little early and had a chance to talk with him a bit before our tour began. He may have been the happiest person we met in China, smiling and laughing so much you just couldn’t help but join his good mood. We were joined by one other couple from London, Richard and Somerset, who were on their honeymoon, and the five of us set out to begin our Beijing food tour. We visited Beijing’s Xicheng District and walked along Huguosi Dajie, a street filled with snacks. Dennis took us to Huguosi Xiachidian, which he said served the most authentic snacks, some of which have been enjoyed by Beijingers for hundreds of years. Huguosi Xiachidian is a huge snack restaurant with two levels. We grabbed a table upstairs while Dennis selected a number of Beijing snacks for us to sample. Huguosi Xiachidian Beijing snack bar. Ground floor interior of Huguosi Xiachidian. Dennis brought back a plethora of Beijing snacks of all different shapes, sizes, and colors. He started explaining what all of them were while we started sampling. Dennis was having a fun time watching us try each of the odd looking snacks, and it became apparent he was waiting for our reactions because there were some that he wasn’t all that fond of either. All of the snacks were fun to try, but some far better than others. We started with jiaoquan, a fried dough ring, simple and crunchy, similar to a churro except not sweet. Some eat it with warmed soybean juice. We also tried tang er duo, somewhat similar to jiaoquan in that it is a fried dough, but tang er duo is sweet. Its name means sweet ear and it is a traditional Islamic snack. My favorite snack was the fried sweet potato chips, first steamed then fried with brown sugar, mixed with candied olives and carrots. I could definitely eat these at home as a snack while watching TV. The hawthorn jelly surprised us with its tart but sweet taste. Hawthorn berries are commonly seen throughout Beijing served on sticks and candied, but tasted even better in the solid jelly. My favorite Beijing snack of the day, and yet I don't know its name. An odder snack was wandouhuang, a pea flour cake, yellow in color, which tastes exactly like solidified split pea soup formed into a soft brick. Not terrible, but just not something I would hanker for as a snack. Below the wandouhuang were similar cakes, one made with green bean and one made with brown bean, which Somerset thought tasted like the inside of a burrito. There were also some glutinous rice cakes, including ludagunr, also called rolling donkey, another Islamic snack, which is glutinous rice rolled with bean paste and then covered in soybean flour. I enjoyed the aiwowo, another Islamic snack that is a glutinous rice ball filled with a mixture of sugar, haw jelly, walnuts, sesame, and more. They are very soft and gummy. Wandouhuang and some glutinous rice snacks including ludagunr ("rolling donkey") and aiwowo. A close-look at aiwowo, a filled glutinous rice snack. After we finished sampling our traditional Chinese snacks, our Beijing food tour continued down the street as we looked at the wide variety of food being sold along the street, some which could be eaten immediately, like barbequed meats and vegetables on skewers, and others to be purchased and taken home to finish, like duck necks and things I didn’t recognize. We even walked by a shop with jars of preserved items, like snake. Street food being sold on the snack street. Preserved items used in traditional Chinese medicine. We then visited a huge covered wet market. A wet market is a market that sells meat and produce, items that are perishable. Dennis explained this was one of the last remaining wet markets within Beijing’s city center. It is now too expensive for these kinds of markets to be in the central, more expensive neighborhood, and they are being pushed more to the outskirts of Beijing. It was interesting walking up and down the rows looking at the fish, produce, meat, pickled vegetables, nuts and more, but it was disconcerting to have to keep our eyes and ears open for bicyclists and motorcyclists riding through the aisles. Beijing wet market, complete with bicycles riding down the aisles. which is a popular ingredient in many Chinese stir-fried dishes. Eggs, including preserved thousand-year eggs, at the wet market. 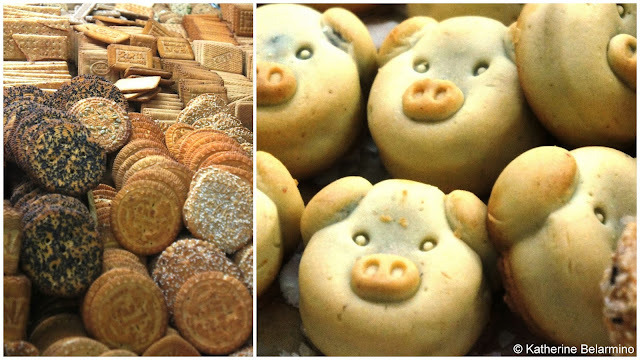 We walked by a bakery with an assortment of fun looking cookies and treats, including some cute little pig shaped pastries. We tried huangqiao, a round, flat sesame seed cake. They were still warm and were tender yet crunchy and slightly salty. We caught a taxi and headed to the hutong area around the Drum and Bell Towers for our last stop of our Beijing food tour, a hosted dinner and dumpling lesson. We were fed a large home-cooked meal, which included vegetarian carrot balls in a light, slightly sweet sauce, stir-fried celery, pork and carrots, and dumplings. The delicious homemade meal prepared for us by our host family. Dennis also explained to us how all the dishes were to be used. We had noticed at restaurants we would be given a set of dishes, usually vacuum packed in plastic. The package would include a small plate, small bowl, teacup, glass, and spoon. We noticed the Chinese would eat right off the plate of food served, since dishes are shared, but we weren't sure how to use the provided dishes. Dennis explained rice is scooped into the bowl using the spoon, and then food is pulled off the plate with chopsticks and eaten over the rice. The plate is for bones, which is only done at restaurants since the Chinese usually spit the bones out onto the table at home. After we had our fill of dinner, our hostess came in to give us our dumpling making lesson. These dumplings were not for eating and were only filled with shredded carrots. She showed us three different ways for folding dumplings, one that looked like tortellini, one that had more intricate folds, and one that was the most common and fastest, but which ended up being the most difficult for us all. Below is a video of two of our dumpling lessons, and you can judge our results. Our host, a kung fu master who looked very much to me like a Chinese Clint Eastwood in his black shirt, black pants, and black leather vest, came in to talk with us as well. We learned about his son, a three-time Chinese National Champion and seven-time Beijing WuShu Champion who studied under the same coach as Jet Li. Then he demonstrated for us how a kung fu master makes dumplings. I really wish I had recorded it. He placed a dumpling wrapper in his palm, spooned carrot filling in the center and carefully and methodically wet the edges all the way around. He then quickly made a tight fist, water and carrot juice shooting out the sides. A kung fu master with a sense of humor. Our host demonstrates how a kung fu master makes a dumpling. We ended our Bejing food tour happy and full. While it had been fun testing the various Beijing snacks and visiting the wet market, the real highlight was enjoying the homemade meal, the hospitality of our hosts, and the opportunity to visit a private Beijing home. Intrepid Travel offers both multi-day and single-day tours around the world, including Beijing, Shanghai, and Xian in China. Visit their website to learn more about joining their food tour in Beijing.